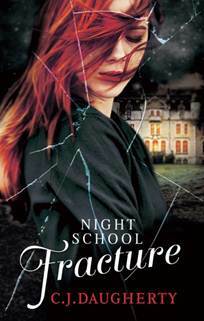 I am super excited to be taking part in the Blog Tour for Night School: Fracture, the third book in CJ Daughtery's brilliant series. To say I'm a fan is a bit of an understatement - I love this series! And CJ has written a short story especially for the tour! The story is set during the Winter Ball, so time wise it fits in with book two in the series, and is written from Carter’s point of view of what happens that night. Grumbling to himself, Carter crouched down to search the back of his wardrobe, throwing out trainers, boots and a scarf he didn’t recognise before finally emerging a minute later, black dress shoes firmly in one hand. 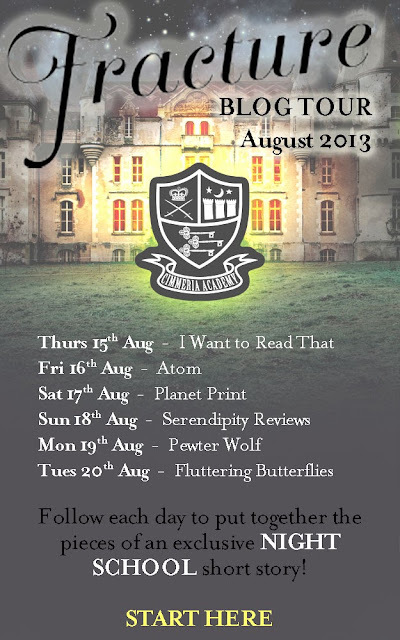 His tuxedo jacket hung from the back of the wardrobe door, black as his mood. The idea of going to the winter ball right now, given all that was happening, seemed patently absurd. Isabelle should have cancelled it. He sighed. The party was happening and there was no getting out of it. He dressed quickly, clipping the cuffs of his crisp, white shirt with the cufflinks Bob Ellison had given to him on his sixteenth birthday – or rather, passed on. Made of silver with a faceted garnet stone at the centre, they’d once belonged to his father. But Carter had long since given up examining the cold metal for any connection to his dead parents. There was nothing there. He stood in front of the mirror, knotting his black tie with the expert ease of familiarity. For a moment he studied himself, seeing the irritation in his dark eyes. The tight set of his full mouth. He clenched and unclenched his hands, trying to force himself to relax. It was nearly nine o’clock. He’d put this off for as long as he could. The sound of the party hit him at the top of the stairs. In the great hall, a string orchestra played a lively waltz. The roar of conversation rose above the music like a wave cresting over a beach. Squaring his shoulders, Carter walked into the crowds. He would show his face, hang out with Jules for a bit then leave when no one was looking. That was enough.